Bacteria are cultivated and studied under laboratory conditions. Numerous media(singular, medium) have been developed for bacterial cultivation. Because the nutritional requirements of bacteria vary widely, there are great differences in the chemical compositions of the media used in the laboratory. 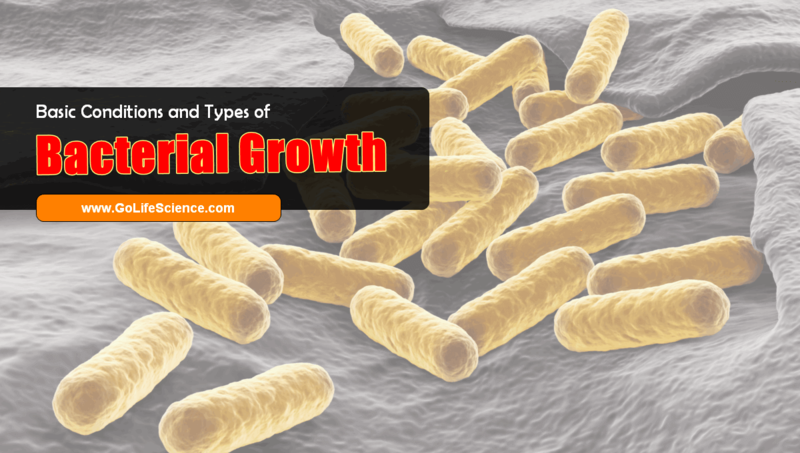 This article gives the details of Bacterial growth. All organisms require a ‘Source of energy’ for their metabolism. Some organisms can use reduced inorganic compounds as electron donors and are termed “Lithotrophic”. Some Bacteria can use organic compounds as electron donors and are called “Organotrophs”. All organisms require “Carbon” ion some form for use in synthesizing cell components. Some can use CO2 as their major or even sole source of carbon; other organisms are termed “Autotrophs”. Others require organic compounds as their carbon source and are termed “Heterotrophs”. All organisms require “Nitrogen” in some form for cell components. Some Bacteria can use Nitrogen from the atmosphere as the forms Nitrates, Nitrite and Ammonium salts, these are derived nitrogen from organic compounds such as “Amino acids”. All organisms require oxygen, sulfur and phosphorous for cell components. All living organisms require “Metal ions”, such as K+. Ca+2, Mg+2, and Fe+2 for normal growth. Other metal ions are also needed but usually only at very low concentrations, such as Zn+2, Cu+2, Mn2+, Mo+6, Ni+2, B+3, and Co+2; these are termed as “Trace elements”. All living organisms contain “Vitamins” and ‘Vitamin like compounds’. These function either as coenzymes for several enzymes or as the building blocks for coenzymes. The physical environment in which the organisms will grow best. They exhibit diverse responsive to physical conditions such as Temperature, Gaseous conditions, and pH. The best temperature for bacterial growth is different. If some bacteria grow in arctic oceans of hot springs, it is not surprising matter. The optimum temperature of bacteria is not constant. In human GUT some bacteria grow very well at human body temperature 370C. But plant bacteria are not able to survive at those temperatures. All processes of growth are dependent on chemical reactions and since the rates of those reactions are influenced by temperature. The temperature that allows for most rapid growth during a short period of time (12 to 24 hours) is known as the “Optimum temperature”. These are able to grow at 00C (or) lower, though they grow best at a higher temperature. Many microbiologists restrict the term Psychrophile to organisms that can grow at 00C but have an optimum temperature of 150C (or) lower and maximum temperature of about 200C. Facultative psychrophile organisms are able to grow at 00C; and temperature in the range of about 20 to 300C. These grow best within a temperature range of approximately 25 to 400C.E.g. : Pathogenic bacteria for humans and Warm-blooded animals. These grow best at temperatures above 450C. The growth range of many thermopiles extends into the mesophilic region; these species are designated “Facultative thermophiles”. Oxygen is both beneficial and poisonous to living organisms. It is beneficial its strong oxidizing ability makes it an excellent terminal electron acceptor for the energy-yielding process known as “Respiration”. Oxygen is also a toxic substance. The following factors are among those that have been implicated in oxygen toxicity. Molecular oxygen can directly oxidize certain essential reduced groups such as thiol (-SH) groups (or) enzymes, results in enzyme inactivation. Eg: Nitrogenase (nitrogen fixation enzymes) destroyed by even small amounts of oxygen. Various cellular enzymes catalyze chemical reactions involving molecular oxygen; these reactions can result in the addition of a single electron to an O2 molecule, by the result “Superoxide radical”(O2–). These superoxide radicals can inactivated vital cell components. Recent studies suggest the production of even more toxic substances by detrimental action of superoxide radical & protons form “Hydrogen peroxide (H2O2)” and “Hydroxyl radicals(OH.)”. O2– + H2O2 –> O2 + OH– + OH. This superoxide radical will eliminate by greatly increasing the enzyme “Superoxide dismutase”. These hydrogen peroxide produced by this reaction can, in turn, be dissipated by “Catalase” and “Peroxidase” enzymes. Elimination of either super-oxide radicals (or) hydrogen peroxide can prevent the formation of the highly dangerous hydroxyl radicals. For most Bacteria, the optimum pH for growth lies between 6.5 and 7.5. Few Bacteria prefer more extreme pH values for growth. For example, “Thiobacillus thiooxidants” has an optimum pH of 2.0 to 3.5 and can grow in a range between pH 0.5 and 6.0. When Bacteria are cultivated in a medium originally adjusted to a given pH, for example, 7.0, it is very likely that this pH will change as a result of the chemical activities of the organisms. Incorporating a buffer into the medium can prevent a radical shift in pH. A buffer is a mixture of a weak acid and its conjugate base (e.g. : Acetic acid (CH3COOH) and acetate (CH3COO–). Phosphate buffer (combination of H2PO4–­ and H PO4-2­) having a pKa of 6.8, is widely used in bacteriological media. Some large fermentation apparatus are equipped with automatic controls that maintain a constant pH. Bacterial growth refers to the increase in cell number or cell population of bacteria. It is brought about by cell multiplication. Binary fission refers to the division of the parent cell into two daughter cells. During binary fission, both cytoplasm and nuclei divide. In budding, the bacterial cell produces a small projection on its surface. It is called bud. It increases in size and separates into a daughter cell. Certain Bacteria grow by producing spores. The hypha at tip produces many spores. The spores separate and develop into new colonies. During growth, a cell divides into two and the two then divide into four unto 8 soon. In this way, the cells grow by geometrical progression. The time required by a cell to divide or the time required for the population to double is called generation time. The generation time varies from species to species and nutrients, temperature, etc affect it. The generation time for E.coli in milk at 370C is 12 minutes. Mean doubling time or generation time denoted as ‘g’. Here N is the number of cells per ml, X is the mass of cells/ml, Z is the amount of any cellular component/ml, ‘t’ is the time and ‘K’ is the growth rate constant. The generation time is defined as the time required for cell components of the culture or the number (or) mass to increase by a factor of 2. It is denoted by the symbol ‘g’. Generation time is also referred to as the time that a bacterial cell takes to go through its life cycle. Generation time is usually shorter for prokaryotes than eukaryotes, a shorter for smaller than for larger cells since the growth rate is proportional to the energy metabolism of the cell. The faster the cell metabolizes nutrients, the shorter it’s generation time. The bacterial growth curve is a graph obtained by plotting the number of cells against time factor. A typical growth curve is obtained when a known concentration of bacteria is inoculated into a suitable culture medium (batch medium). The Bacteria grow by dividing binary fission. The bacteria cells are counted at regular intervals of one hour. The numbers of Bacteria are plotted against time. A typical Bacterial growth curve shows four distinct phases of bacterial growth, viz Lag phase, Log phase, Stationary phase, and Decline phase. Lag phase: The phase represents an initial period of no growth in terms of an increase in cell numbers. In this phase, the cells are metabolically active, capable of repairing cell damage and synthesizing enzymes. Log Phase: The Lag phase is followed by a period of rapid growth called log phase. In this phase, the Bacterial population increases exponentially and is also called the Growth phase. Stationary phase: Log phase followed by a stationary phase during which no new growth occurs. Decline phase: In the viable population in which all-microbial cell die. This phase is called the decline phase or death phase. When a nutrient is regularly added to the culture, the Bacteria growth continuously and we get a continuous culture. In continuous culture, the bacterial population remains in the log phase and there will be no stationary and decline phase.